I make no secret of the fact that I love everything DOC has to offer, so when I was invited to a Zomato meet up at their Carlton Delicatessen, I jumped at the opportunity. Coming from a very traditional Italian family, I’ve been spoilt with great food my entire life, however I’ve often struggled to find the same quality in restaurants. DOC is most definitely the exception to this. Offering authentic and simple yet contemporary Italian food, this quickly expanding group are setting the standard for Italian cuisine in this city. Starting from very humble beginnings in a small Templestowe pizza shop, the DOC empire now includes an espresso bar, a delicatessen and three pizza and mozzarella bars. 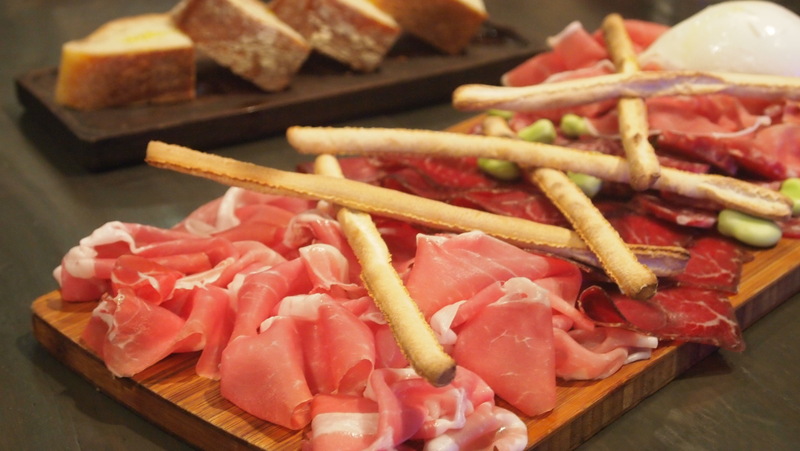 The entire operation has been built around the desire to showcase the best of Italian food to Melbourne. Stocking both imported and locally sourced goods, everything served or made available for purchase at DOC is of the highest possible quality. I’m talking about beautiful prosciutto that just melts in your mouth and the most divine buffalo mozzarella I’ve ever tasted. Just before dinner we were fortunate enough to meet Tony Nicolini, the man behind the growing empire and got to hear his story of why and how DOC came to be what it is today. He displayed such infectious passion for Italian cuisine, it’s not hard to see where the drive and direction of the group has come from. They really pulled out all of the stops for our dinner, serving up three courses of the best Italian food I’ve enjoyed outside of the family home in some time. 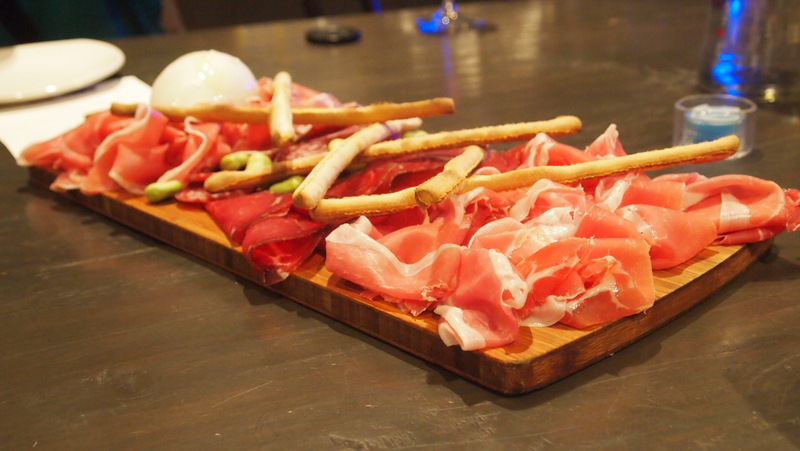 We kicked things off with a charcuterie board including San Daniele Riserva, Wagyu Bresaola, Prosciutto Di Parma, Casalingo Di Borgo and locally handmade mozzarella. Everything on the board was really impressive, but the mozzarella and prosciutto really blew my socks off. The mozzarella was incredibly soft and pulled apart so easily (it was the polar opposite of the rubbery mozzarella found in most supermarkets), plus the flavour was simply divine. Everyone at the table agreed that this mozzarella was second to none. The prosciutto was just as good, it wasn’t overly salty and was so tender I almost didn’t need to chew it. 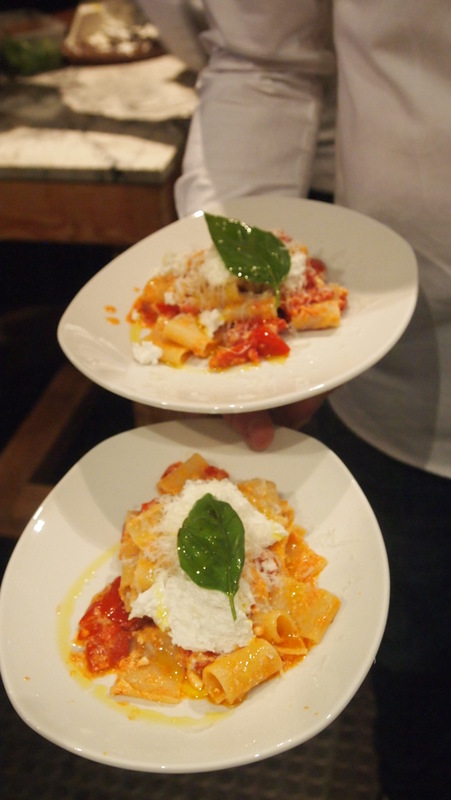 Next up was the Mezzo pacchero pasta from Gragnano served with spaccatella tomatoes, buffalo ricotta and fresh basil. 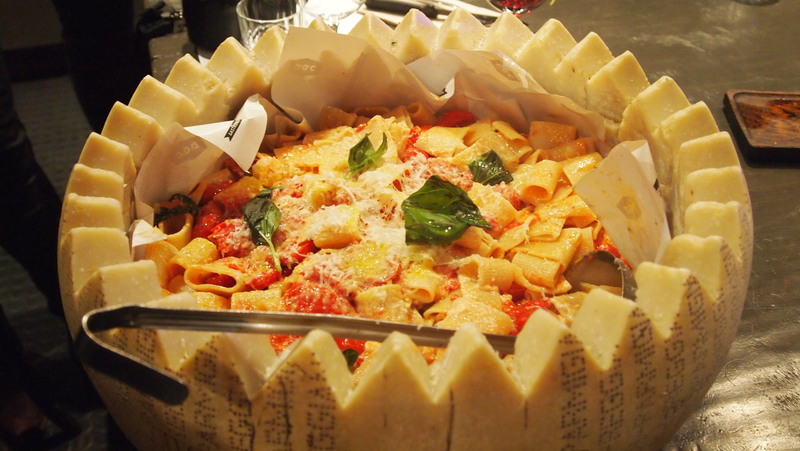 We knew we were in for something amazing when our pasta was delivered to the table in a giant hollowed out cheese wheel (naturally this group of bloggers went camera crazy to the amusement of the DOC team that was patiently standing by to serve the pasta). Once we were done taking photos, the chef started dishing up the pasta, topping each serve with a generous portion of buffalo ricotta and freshly grated parmigiano.The pasta was perfectly al dente just the way it’s supposed to be and the fresh tomatoes were only cooked to the point that they had softened up, but retained their shape. Mixed with the fresh basil and cheeses, it highlighted how the simplest dish can be extraordinary when it contains quality ingredients. The whole table was silent as we shovelled down this delicious pasta and had there been more left over, we could have easily gone for seconds. 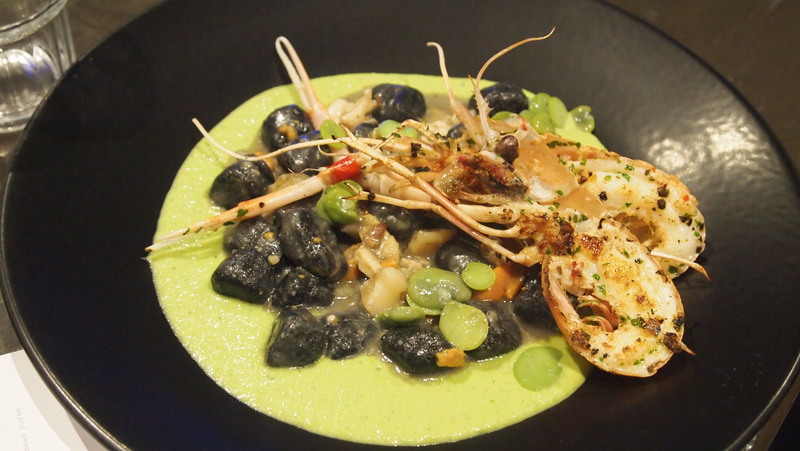 The next dish to be served up was handmade squid ink gnocci with scampi and scallops on a pea and broadbean puree. This incredibly vibrant dish was literally cooked and dished up table side, filling the room with the beautiful aroma of freshly cooked seafood. Unfortunately for me, I have a shellfish allergy (and like an idiot forgot to advise them about it), so I couldn’t enjoy this dish but by all reports it was just as delicious as the previous pasta. 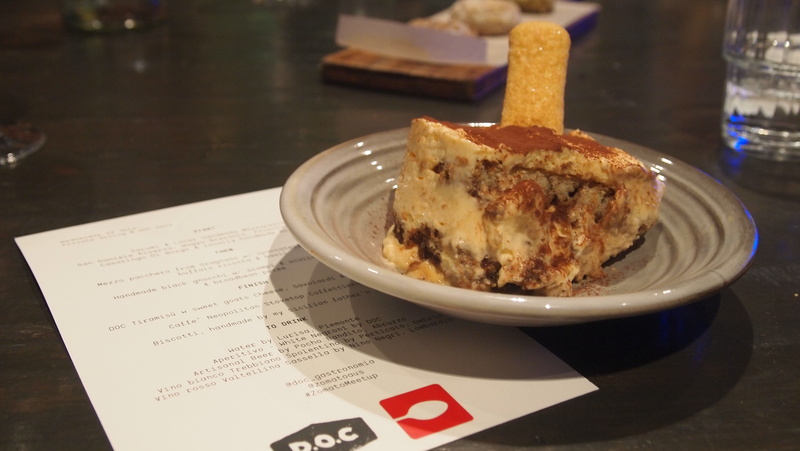 By this stage of the night, everyone was feeling pretty full, but after a short breather we were served dessert which was the DOC Tiramisu made with sweet goats cheese, Savoiardi and Montenegro. I’m not usually a big fan of Tiramisu ( I know, it’s sacrilege given I’m Italian) so I was a bit apprehensive about trying this one, but my concern was definitely not warranted. It was a traditional version of the iconic desert with the point of difference begin the goats cheese mascarpone which was creamy but had a more subtle flavour than what I’m used to. All in all it was a great take on the classic. So I’ll end this post as I started it, I love everything DOC has to offer and this great night confirmed in my mind that they are well and truly at the top of their game. I was invited as a guest of Zomato and DOC however all opinions contained within this post are definitely my own. Ohhh lucky lady!! Wish I was there for this one, too! I love this place!